Increasing volumes of international freight traffic and the scarcity of resources are leading to ever higher prices and the urgent necessity to reduce CO2 emissions. In the passenger-vehicle market, these global trends have already prompted the introduction of innovative concepts. In the freight-vehicle sector, however, alternative technologies have not yet made any significant advance. In heavy inner city start-stop traffic, fossil fuel-powered trucks burn an unnecessary amount of fuel and cause local air pollution. For inner city use, the relatively short range is usually not a big problem, but the high purchase price is. It’s likely to just be a question of time before ever stricter emission restrictions in inner cities, together with increasing fuel prices, will stimulate electric freight transport in whatever form. AT - Auto Tensioning - Catenary wires are kept at a mechanical tension because the pantograph causes oscillations in the wire and the wave must travel faster than the train to avoid producing standing waves that would cause wire breakage. Tensioning the line makes waves travel faster. For medium and high speeds, the wires are generally tensioned by means of weights or occasionally by hydraulic tensioners. AT ensures that the tension in the equipment is virtually independent of temperature. Tensions are typically between 9 and 20 kN (2,000 and 4,500 lbf) per wire. Where weights are used, they slide up and down on a rod or tube attached to the mast, to prevent the weights from swaying. Catenary - To achieve good high-speed current collection in overhead lines used to transmit electrical energy to trams, trolleybuses or trains, it is necessary to keep the contact wire geometry within defined limits. This is usually achieved by supporting the contact wire from above by a second wire known as the messenger wire (US & Canada) or catenary (UK). This wire approximates the natural path of a wire strung between two points, a catenary curve, thus the use of catenary to describe this wire or sometimes the whole system. A catenary is the curve that an idealized hanging chain or cable assumes under its ownweight when supported only at its ends. The curve has a U-like shape, superficially similar in appearance to a parabola(though mathematically quite different). Pantograph - A hinged electric-rod device that collects electric current from overhead lines for electric trains or trams. The pantograph typically connects to a one-wire line, with the track acting as the ground wire. The term stems from the resemblance to pantograph lever-rod devices for copying handwriting and drawings. The pantograph was an improvement on the simple trolley pole, which prevailed up to that time, primarily because it allowed an electric-rail vehicle to travel at higher speeds without losing contact with the catenary. Supercapacitors promise to drop electrical running costs for trains powered by overhead lines or third rails. Kinetic braking energy is reclaimed by storing electrical energy in supercapacitors onboard the vehicle. This stored energy is used when accelerating the train, when high current is needed. The supplementing supercapacitors reduce current drawn through the electrical supply during acceleration and puts less strain on the distribution system. Trolleytruck (also known as a freight trolley or trolley truck) is a trolleybus-like vehicle used for carrying cargo instead of passengers. A trolleytruck is usually a type of electric truck powered by two overhead wires, from which it draws electricity using two trolley poles or two pantographs. Two current collectors are required in order to supply and return current, because the return current cannot pass to the ground (as is done by streetcars on rails. since trolleytrucks use tires that are insulators. Lower powered trucks, such as might be seen on the streets of a city, tend to use trolley poles for current collection. Higher powered trucks, such as those used for large construction or mining projects, may exceed the power capacity of trolley poles and have to use pantographs instead. Trolleytrucks have been used in various places around the world and are still in use in cities in Russia and Ukraine, as well as at mines in North America and Africa. UEV - Urban Electric Vehicle - Falls under a federal classification of vehicles called Low-Speed Electric Vehicles (LEVs), which can be cars or trucks. They meet all federal safety requirements for a low speed vehicle and can be operated on streets with speed limits up to 35 mph. Urban electrics are based upon the micro car and truck technology that’s been proven on the streets of Europe for well over a decade. LEV's can be driven on public streets with posted speed limits of 35 mph or less. Certain restrictions apply from state to state, however. Reduced CO2 Pollution - Freight transportation on U.S. roads is expected to double by 2050, according to the World Business Council for Sustainable Development. But long before then, by 2030, the carbon dioxide emissions caused by freight transport are forecast to increase 30%. Range - For medium and long distance freight transport, the current generation of batteries cannot store enough energy to make this practical. Hydrogen and biofuels may play a role in that arena, but both have their own problems with regards to infrastructure, the possibility to scale up, and sustainability. Icing - Highway overhead wires may be impractical in areas where ice can accumulate and bring wires down - especially on roadways shared with other vehicles. 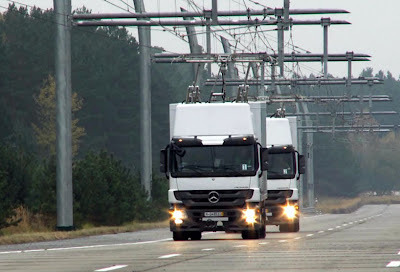 Siemens introduced new technology The new technology, called eHighway, is a highway electrification system that uses overhead electrical wires to transmit energy to freight trucks in select vehicle lanes, similar to modern-day streetcars. More than 40% of freight that arrives in the U.S. via shipping containers comes through the ports of Long Beach and L.A. That freight then has to be trucked to rail stations and other points of distribution. More than 10,000 trucks serve these two ports, according to a 2011 analysis conducted by the Port of L.A. The movement of goods through Southern California’s ports affects almost 17 million people and causes billions of dollars in health-related costs annually, according to a 2011 report from the South Coast Air Quality Management District. The report cites that levels in port areas are far higher than in other communities due to the activity of trains, trucks, ships and heavy equipment. For California to meet federal air quality standards, the AQMD has said the region will need to accelerate its transition to zero- and near-zero-emission trucks and cars. Amp Electric Vehicles (OTCBB: AMPD )- Loveland, Ohio - Publicly traded since 2010, though the stock price has plummeted from $0.50 to $0.16 in the last six months. AMP's methodology is to start with mass produced, best-of-breed ICE based vehicles and then add off the shelf automotive hybrid components coupled with our custom software and electronics. They then re-certify and validate the vehicles to ensure that the transformation did not compromise any of the original safety or reliability of the vehicle. The result is that they arrive at the marketplace with a fully validated EV for under 10 million dollars in development. Contrast this approach to that of their peers that are building EVs from the ground up and it becomes clear that it takes north of a billion dollars to arrive at the same marketplace with a ground up vehicle. Their first two vehicles to market will be based on the 2012 ML and the 2012 Jeep Cherokee. With all of the models that they use as base vehicles, they expect to negotiate volume discounts and possibly buying the vehicles without the engine and other ICE components. AMP looked for applications that got very poor gas mileage (so that the payback would be quicker) and traveled less than 100 miles per day so that range was not an issue. So, re-powering fleets that utilized larger vehicles for urban deliveries came into focus. 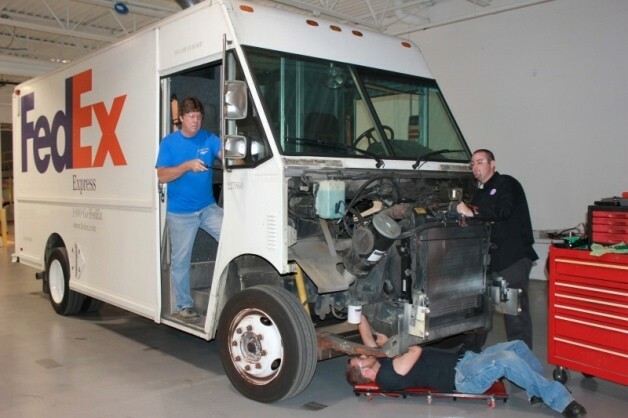 And the clearest vehicles that emerged were the step vans used by the likes of FedEx, Navistar. The chassis and bodies on these types of vehicles are typically used for 20 years. So, removing the diesel based drivetrain and re-powering 10-year-old vehicles with all electric drivetrains looked to be the most cost effective manner to get tens of thousands of these vehicles converted from very dirty old style diesel to zero emission electrics. The key was to get the payback under 5 years. Preferably 4 years. Their ML EV drivetrain pushes around a 5,000-pound vehicle spiritedly. So, the task of moving a 14,000-lb vehicle somewhat spiritedly was not too daunting of a task. They utilized their dual Remy model model with large scale cells and the same control software/hardware. Balqon Corporation (OTCBB: BLQN) - Harbor City, California- A leading developer and manufacturer of zero emission heavy-duty electric trucks, lithium battery packs and electric vehicle drive systems. Balqon vehicle products include yard tractors used at warehouses and ports and on-road zero emission short haul drayage and inner city applications. In May 2012 Balqon received a $630,000 contract from the Port of Los Angeles (“POLA”) to retrofit six electric powered yard tractors, converting battery packs from lead acid batteries to higher energy density lithium batteries to increase the daily range of the vehicles. For the past eight months, Balqon and POLA have been jointly testing two yard tractors fitted with Balqon’s next generation lithium battery system at a local intermodal facility. “This contract to upgrade six extended range yard tractors to POLA’s demonstration fleet will allow us to showcase our current technologies to local marine terminals, warehouses and rail yards,” said Mr. Balwinder Samra, CEO of Balqon Corporation. “The past eight months of testing demonstrated that the vehicles retrofitted with lithium battery systems have an increased range of 12-14 hours on a single charge, and these results now need to be validated at other application settings such as marine terminals and rail yards.” “Being the only manufacturer of zero emissions yard tractors in the world, providing additional units to POLA provides us with the ability to introduce our technologies to a larger customer base in the San Pedro Basin region,” he added. GGT Electric - Milford, Michigan - An automotive engineering, design and manufacturing company. In 2011, introduced a new line of all electric trucks for sale. GGT has developed LSV zero-emission electric vehicles for fleet markets, municipalities, universities, and state and federal government. The company offers 4-door electric pick-up trucks, electric passenger vans, and flatbed electric trucks with tilt and dump capability. Nissan - A prototype zero-emission all-electric delivery vehicle is ready to start extensive real-world testing on the streets of London. 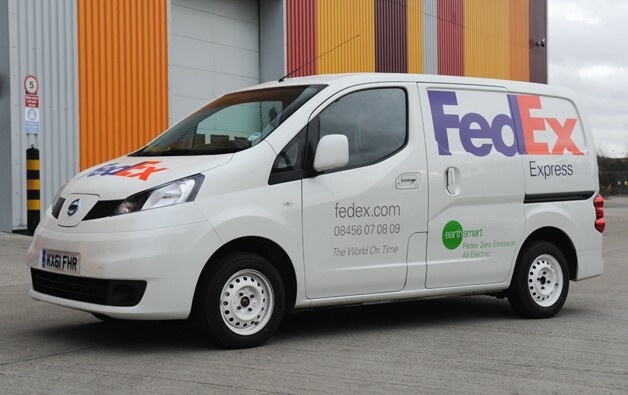 FedEx Express and Nissan collaborated over a two month period in early 2012 to evaluate how the NV200 electric vehicle (EV) prototype copes with the rigours of daily duties in London. Performance specs for the prototype have not been released, but since it does use the same 80-kW motor and 24-kWh battery drivetrain as the Nissan Leaf, it likely puts up slightly lower acceleration and range numbers than the consumer hatchback. 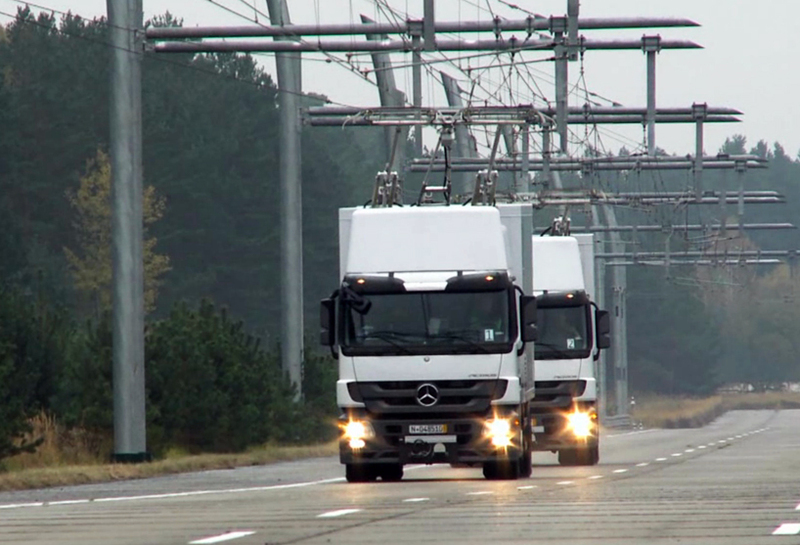 Siemens eHighway - eHighway’s catenary system uses diesel hybrid trucks outfitted with software that senses when an overhead electrical line is available and automatically connects or disconnects as needed. When the trucks’ rooftop connectors are attached to the electrical lines, the trucks run entirely on electricity. When the connectors are lowered, they run on a hybrid electric propulsion system similar to the Toyota Prius. In hybrid mode, the trucks save 30% on diesel fuel. In addition to reducing emissions, the trucks also reduce noise pollution. But there is a downside: Siemens estimates the system will cost between $5 million and $7 million per mile to build. This is a proposed retrofit to existing Equipment, which in turn allows for more commercial vehicles to support it. Plus it does not depend on the driver to manage the connections to the wire, thats all done automatically for the best efficiency. Smith Electric Vehicles - privately held company headquartered in Kansas City, Missouri - Manufactures and markets zero-emission commercial electric vehicles that are designed to be a superior-performing alternative to traditional diesel trucks due to higher efficiency and lower total cost of ownership. Customers include many of the world’s largest fleet operators, including PepsiCo’s Frito-Lay division, TNT, Sainsbury’s, Coca-Cola, DHL, FedEx and the U.S. Military. Smith currently designs, produces and sells two vehicles, the Smith Newton and the Smith Edison, both of which can be configured for multiple applications. Smith has manufacturing facilities in Kansas City, Missouri and outside of Newcastle, UK. In 2011, Smith US purchased the zero-emissions vehicle business of the UK-based parent company, which has been in operation in Europe since the 1920s. In January 2011, Smith Electric Vehicles proposed to a diverse mix of for-profit and nonprofit organizations that the first of an intended series of meetings be held to discuss shared issues and challenges related to the viability of commercial vehicle electrification and the dynamics of high-change market adoption. Invitees/attendees to the “Table of Twenty” included experts in electrification, geopolitical dynamics, social/environmental issues, finance, manufacturing, and commercial/fleet transportation. The first Table of Twenty meeting was held in Kansas City in February, 2011 and the second meeting was held in May, 2011. ZAP Jonway (OTC: ZAAP) - Founded in 1994 and is headquartered in Santa Rosa, California - Together with its subsidiaries, engages in the design, development, manufacture, and sale of electric vehicles and electric vehicle power systems primarily in the United States. Zap's stock has tumbled 80% in the last 12 months, closing at $0.10 on July 24. ZAP incurred net losses of $40.8 million, $19.0 million, and $11.3 million for years ended December 31, 2011, 2010 and 2009, respectively and has had net losses in each quarter since its inception. Jonway incurred net losses of $ 10.2 million and $445,000 for the years ended December 31, 2011 and 2010. In 2008 Wired has now pubished a detailed article on the often sordid 16 year history of Zap! and its two primary leaders Gary Starr and Steve Schneider. Schneider and Starr have apparently "built" a business on alternating press releases about world-beating new electric cars and issuing new stock to continue paying the bills, including their salaries. Meanwhile enthusiastic prospective retailers of Zap products like Ehab Youssef and Joseph Gottlieb with little experience in the realities of the car business, have plunked down large amounts of cash for the right to sell vehicles that either come nowhere near meeting their rated specifications or never materialize at all. The company now has new management. Its products include The ZAPTRUCK XL, a plug-in-electric vehicle principally designed for fleet operations; ZAPVAN Shuttle, a multi purpose, plug-in-electric vehicle for municipalities, colleges and universities, airports, hospitals, or corporate campuses; and Xebra Sedan, a vehicle that holds up to four passengers, as well as other gasoline powered sport utility vehicles. The company also markets various other forms of transportation, including alternative energy and fuel efficient automobiles, motorcycles, bicycles, scooters, personal watercraft, hovercraft, neighborhood electric vehicles, and commercial vehicles. In addition, it operates a retail car outlet that sells pre-owned conventional vehicles and advanced technology vehicles. The company primarily offers its products to military, government, and corporate fleets; and has contracts to provide vehicles to the State of California, Presidio National Park, Federal Aviation Administration, Department of Energy, the U.S. Army, United Parcel Service, City of Riverside, and the City of Monterey. ZAP markets and sells its vehicles to consumers through Internet and in person at its Santa Rosa location, as well as through dealers in the United States. The company was formerly known as ZAPWORLD.COM and changed its name to ZAP in 2001. In January 2011, Zap completed its acquisition of 51 percent of the capital stock of Zhejiang Jonway Automobile Co. Ltd. of Sanmen, Zhejiang, China. Cathaya Capital LP has funded the aggregate amount of US$36 million. With ZAP’s electric vehicle (EV) technology expertise and international experience, the combined company intends to build the necessary production platform to address the Chinese EV market. The newly combined company, to be renamed ZAP Jonway, will leverage Jonway Auto’s A380 SUV, as well as its established distribution channels to the Chinese market with over 90 direct dealers.